The waitress, pushing a cart loaded with used dishes, looked at me with intensity; it's when I suddenly realized that I had been staring at her with burning anxiety in my eyes. In college, I studied French for three years, but I hadn't used it since. Thus, my French had been 还给了老师 or "returned to the teachers" (a Chinese saying that describes the phenomenon of forgetting). I wanted to practice the little bit of French left inside of me during this trip. At the end of our breakfast, I had some leftover coffee in my mug that I wanted to take with me. "How do you say 'paper' in French?" I asked my husband, who speaks French. "How do you say 'cup'?" 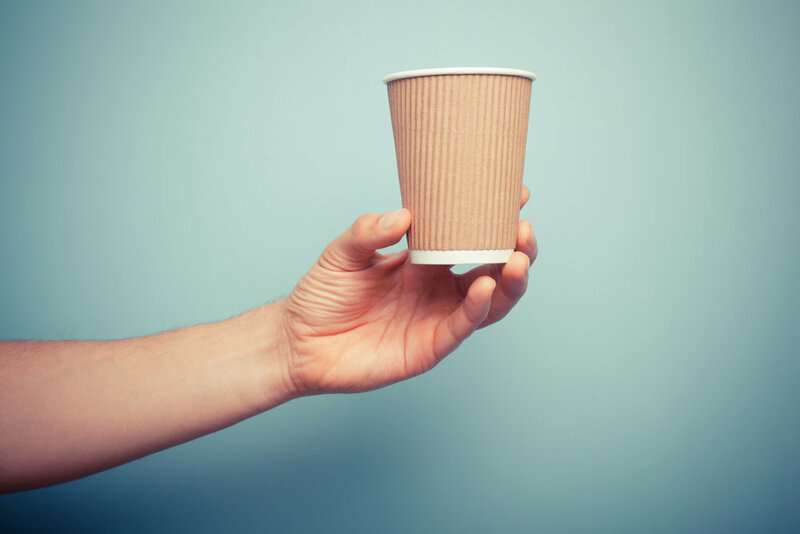 "Tasse paper?" I asked, stringing the words together and remembering the French rule that the adjective goes after the noun. Laughter erupted from my husband, "Gisela, French isn't Chinese that just piles nouns together." "Un tasse or una tasse then?" I further asked. More laughter, "This isn't Spanish. Una is Spanish." When I was staring at the waitress anxiously, I was getting ready to ask for the paper cup in French. She came closer. I turned my head and looked at her straight in the eyes. I knew the testing results would be out in a split second. "Un tasse paper," I finally asked. "Oui!" She nodded with no hesitation and headed straight into the kitchen behind our table. "Un passe de paper," my husband corrected me, "You need 'de' there." Referring to my background in linguistics, he continued to joke, "I can see you're going to fix the French language — get rid of all the articles! It has only been like that for 400 years anyway!" "You don't even know how to conjugate a verb," my daughter added. She had been learning French at her school for three years. Obviously, she regarded verb conjugation ability as the quintessential indicator of French ability, telling of her learning experiences. "The true test is to speak it and to see whether or not people can understand you," I explained. That marked the beginning of my French experience in French Canada. while facing the relentless "support" from my family, I learned my first lesson. Lesson 1: It takes courage to use a foreign language in a foreign country. If you are a parent or a teacher, have more empathy for your child or student. If you are a student, muster up your courage and just use the language! I knew this all along. However, until my "paper cup" experience, I didn't fully understand how scary it can be, particularly for children who are shy. Just during this past 2016 Summer Camp in China, I encouraged some children to ask for yán (salt) at a restaurant, buy shuǐ (water) at the park, and to ask for fang xiàng (directions) on the street, all on their own and in Chinese. Some children did it easily, whereas others needed a gentle or even a strong nudge. During one incidence when a child finally opened her mouth to ask a hotel clerk for fáng kǎ (room key card) in Chinese, I saw the the fear in her eyes — I can fully relate to her now. It was the end of the second day in Montéal and we had just finished visiting the Biodôme. We were eating at a small restaurant, and as usual, the young waitress serving us switched between speaking English and French seamlessly. "I'm not even that bilingual," my daughter mumbled as the waitress walked away from our table. My daughter speaking English as her dominant language, and speaks Mandarin fluently enough to communicate without obstacle with people in China. Growing up, many people had complimented her fluency in Mandarin, and thus, planted in her the concept that she was a fluent bilingual. I was thrilled to see her come to the realization that she was "not even that bilingual" in comparison to the folks here in Montréal. It is always an inspiration when you are working on something and then to find someone else who does it better than you. At that moment, the first time in her life as a bilingual, my daughter was immersed in a setting full of such people — on the streets, at restaurants, train stations and museums. Everywhere. Being in Montréal was also the first time in my life where I saw with my own eyes, both at the individual and societal levels, what the word "bilingualism" truly means. As a fluent bilingual of Mandarin and English, I tend to forget that I can speak English when I'm in China, or that I can speak Chinese when I'm in the United States. Having been to Montréal, I realized that both China and the U.S. are such monolingual societies. It may not be an accident that, in academia, the strongest advocates for bilingual education have come from Canada — Ellen Bialystok, Jim Cummins, and many others. I've been to a few European cities like Helsinki and Amsterdam. I was impressed that majority of the Europeans I have encountered there spoke English really well. However, the European scene is different from Montréal. In Montréal, the high frequency in which people switch between languages, the ease in which they do it, and the expectations of everyone around being able to do it are all the factors that make it such a unique bilingual society. Lesson 2: A fully bilingual society is possible and it exists, this means any monolingual society can have the potential to be more bilingual. While we may not be interested in waiting for the national policies to change, as parents and teachers, we can bring our children to see any highly bilingual society, allow them to mingle with the bilingual folks there and to be truly inspired. After Montréal, we went to a town called La Malbaie, located on the bank of the St. Lawrence River in Québec, Canada. 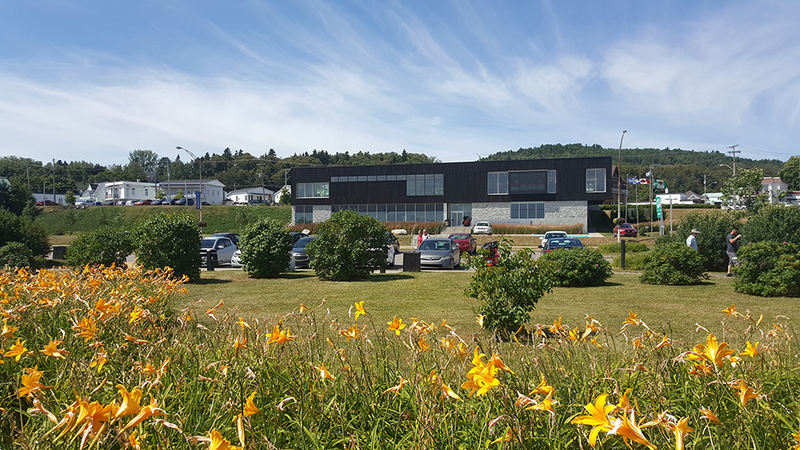 This town is an isolated French-speaking community, from the earliest French settlements to the early history of Canada to up to 50 years ago. I learned this from chatting with Darlene, the only native English speaker I met in town. She married a local and moved there 12 years ago and teaches English for a living. On a stroll in town, my family and I stepped into the town's public library. The library is a black building with a thoroughly modern interior design. All the books are in French and it has a large children's section. Floor-to-ceiling windows provide readers with an expansive view of the calm bay of the St. Lawrence river. Seeing the many shelves of children's books in French, I wanted to find out whether there are activities for children. So, I approached a young librarian (perhaps of high school graduate age) and asked, "Do you have activities for children?" She replied, "Yes, we do." She said the library will be hosting a game day the coming Thursday, and any person age 7 and up can participate. I told her I will come to the event. Then I asked whether or not there are French classes in town, the young librarian immediately said, "There is a teacher. She is here." She led me through some shelves to the back of the room, and that was how I met Darlene. The young librarian swiftly left and I saw the look of relief when she handed me over to Darlene. I quickly found out that Darlene teaches English and not French. We had a good chat, though, mainly about the town. After that encounter, I kept thinking: why did the young librarian looked so relieved when she handed me to Darlene? It dawned on me that it was, at least partially, because she no longer needed to speak English with me. Although the young librarian and I were able to carry out a conversation, I could tell it was tough on her. She paused to retrieve words, to compose her sentences, and sometimes she simply waved her hands to gesture that she gave up on expressing an idea with words. So I learned my lesson 3. Lesson 3: It is mentally exhausting to speak a language that one is not fluent with. Therefore, it's natural for someone to avoid it as much as possible. As a learner, you need to push yourself harder to speak the language. As a parent or a teacher who is trying to get your children or students to practice a foreign language, you need to be empathetic but also relentless at the same time. On Thursday morning, I arrived at the library at 10am, the time I was told when the game day would start. I had been excited the previous days in anticipation of this whole of activities. I imagined myself mingling with French-speaking children and adults, and being immersed in the French language and games. I hoped to experience what my Chinese language students experienced when put into a total immersion setting. But to my disappointment, the game day was not, as I imagined, organized games led by library staff but rather a self-serve table full of board games and puzzles where children can just walk in and play any game they wanted. I waited for a while but no child showed up to play. So, I left the library. At that point, I had no one with me. My husband and daughter boarded a boat for a one-dat whale-watching trip. I gave that up for this game day. The previous few days in town, I had been following my French-speaking husband, but today, I needed to fend for myself. With nowhere to go, I went to the bakery that we went to the past two mornings for breakfast. I stood in line with only French speakers all around me. It was my turn to order. The girl behind the counter greeted me with a big smile and she recognized me. I intended to buy a box of greeting cards they had on display for sale, so I asked the girl, in English, "Can I have a box of your greeting cards?" The girl looked at me, bent down behind the counter and re-emerged with a plastic sandwich box, "This box?" I tried to explain it again and pointed to the shelf. Seeing that, she was still having a hard time understanding me and the line was building up, I gave up and just said, "No, no. A croissant and a coffee, please." While drinking my coffee and overlooking the bay, I realized that the "game day" confusion might have also been the result of the language barrier. When the young librarian told me about the event, she could have went into more details if her English was better, or better yet, if our exchange had been in French, she might have chatted away. But because our conversation was in English, she either had chosen to omit the details to avoid further exhaustion or she simply was not able to explain to me clearly. Lesson 4: The inability to communicate in the dominant language of your conversation partner puts you at a disadvantage in terms of receiving information. This can create bumps here and there in the course of daily life, resulting in loss of time, opportunities, and even just lower the quality of life. I used to think gestures and smiles can get me through most language barriers, but I was somewhat wrong. After the bakery, I decided to walk the one-hour route back to our hotel. On the way, I passed a grocery store where we shopped the previous two days. I went in, picked up a box of cherry tomatoes and headed to the cashier. I was anticipating a quiet transaction — I would show the lady the tomatoes, spread out my bag of coins, and she would take the right amount. Instead, I was greeted with "Bonjour! Ca Va bien?" and a big smile from this middle-aged lady with short red hair. I replied, "Bonjour!" She pointed to the deli counter next to her and uttered something really long in French. The only word I caught was "manger" (to eat). The last time we were here, my husband bought a beef potato potpie from that counter and chatted with the lady at the counter for a while. The pie was delicious. I thought this lady asked me to buy another one of those potpies, and I wanted to say that I would love to but I had only enough money with me for the tomatoes. Of course my French was not enough for me to say anything close to that. So, I simply shook my head. Upon seeing me shake my head, the smile on the lady's face withered away like a flower. I thought to myself, she is not happy because I don't want to buy another pie? Wait a minute. Did she ask me how the pie tasted? That must be it. I care about the social consequences of miscommunication, so I wouldn't let a situation like this pass in such an awkward way. After I got my change, I looked at the lady, pointed to the deli counter, with a thumb up and said, "The pie, delicious! Excelente!" Later on I realized it was "excellent" in Spanish, but in any case, a big smile came back on her face. I left the grocery store feeling stunned by this potpie experience. To be honest, having lived in China and the U.S., and not having traveled to a monolingual region in which I didn't know the language, this was practically my first real language barrier experience. The scenes of the past few days came back to me: my husband chatted away with these folks like old neighbors; at the bakery, he was able to order a special of assembled local cheese platter that was not even on the menu. There are research findings showing that nations with higher level of bilingualism have the upper hand in international trading — they are able to export to more nations. During our stay in La Malbaie, I saw this logic proven at the individual level by simply contrasting how my husband and I fared everyday. 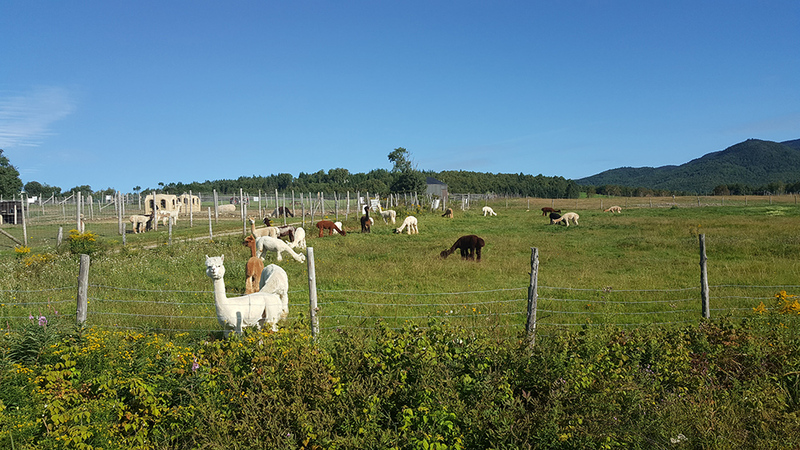 Lamas grazing on a field on the way to Québec City. On the morning of departure from La Malbaie, we were picked up by a taxi driver who had been driving us for the past few days. He had agreed to drive the three of us from the town all the way south to Québec City, at a fare cheaper than the train that we would otherwise have taken. That barn was knocked down by heavy snow last winter and the owner is half way done repairing it. That red brick building is a convent for nuns. Tunnels were dug under the highways in this area in order for the mice to cross underground. The other day, a mouse couple was eating their breakfast in the woods nearby. You can ski down that mountain and you will feel like you are going right into the river but actually won't. The founder of this circus was from the town named St. Paul. Every July at the St. Anne's Cathedral over there, there is a festival. People, some sick or with crutches, come from all over to seek cures. That island is called Orleans. It is 45 kilometers all around, with many villages producing apples, raspberries and many other goodies from nature. Those were only a small portion of what he told my husband. I learned it through my husband's translation during moments when he could spare me. Without a language barrier, the atmosphere turned intimate. By the end of the trip, we felt comfortable enough to ask about the history behind Québec's quest for independence. The driver told us the history and did not mind revealing his personal preference. Lesson 5: Not knowing the language can be overall limiting to your experience in a new culture. Knowing the language gives you a fuller a richer experience. A lesson that is simple, but true. At the beginning of the trip, I tried to use French as much as possible. For example, if I wanted to buy a bottle of water, I would ask my husband how to say it and use it to get what I needed. I did the same for asking the price of things, ordering food and so on. However, I soon found myself no longer doing that. The reason was that I quickly forgot what I learned on the spot and found myself asking for help again the next time I needed the same thing. There are a lot of things to be done while traveling — making the hotel checkout times, finding out directions, being unsure which is a better place to eat — all that gets tiring. So, in the midst of everything, if you have to constantly ask how to say this and that, you can lose the sense of flow for things. I have seen this with families who traveled with our Summer Program in China. Children who had some Chinese foundation always got more out of the trip by using what they knew and being prepared. Lesson 6: Prepare ahead of time and then you can take bigger advantage of the travel in a language immersion setting. Before traveling to China for example, prepare a set of words and phrases that will be useful to you, and make sure you know the most basic ones. Try to avoid going to China with no Chinese at all, or having an overly ambitious language goal that your Chinese will suddenly take off overnight, because the reality is, with the demands of travel logistics, an overly ambitious plan may be given up quickly, making you forget to use even what you actually have mastered. Part 8: "You Will Learn French!" Prior to this trip, I had long known that my husband could speak French fluently. His father worked for the U.S. State Department and his family was stationed in Paris for two years when my husband was a boy. On this trip, I was unconsciously curious about his French. Each time he uttered some French to a local, I would immediately examine the waiter's face, to catch any clue to his French skills. One hundred percent of the time, I saw nothing. The locals processed his French as if he was one of them. In addition to these "field tests," my ears were full of compliments from the locals for his French accent (maybe Parisian), including, "You can find a good job here with no problem!" The strongest evidence was simply how much he could get done or get away with, and all the chatters and laughter he and his "locals" were engaged in. Having taught children the Chinese language for a decade, the default of my thinking has been: how to improve the students' time-spent-learning Chinese "investment-return" ratio. Therefore, on last day in La Malbaie, I asked him, "Exactly how many years did you study French?" "Two to three years," he said. "Your school was an international school with only French classes as one of the subjects, and you didn't speak French at home, right?" I questioned again. "Then how did you actually learn your French?" I got more curious. "Oh, from my French teacher. She said I was lazy and asked me to stop fooling around in the back of the classroom. She told me, 'You will learn French!" Lesson 7: Not all children would pounce with enthusiasm at the idea of learning a new language that they need to work hard on. Some children need someone who can forcefully push them while remaining supportive. I would still dismiss any teacher who utters the word "lazy" to any student, but I'm completely certain that my husband's teacher knew what to do to turn this "lazy student" around. "You will learn French!" — is not something a teacher without confidence in both her students and her teaching ability would say. "You will learn Chinese!" — Just change the word and this can turn into the motto for our students and teachers. On our way back to the U.S. from La Malbaie, we arrived at the Montréal bus station. We are only a bus ride of under 3-hours to Burlington, Vermont, just south of the US-Canadian border. "Do you think there are a lot of Americans in Burlington that can speak French?" I asked my husband. I had been to Burlington a number of times, but at the Montréal bus station, this question came to me for the first time. I guess that seeing people switching between two languages as part of their daily life in Montréal, and realizing how close the two cities are, made me feel that the answer should be yes. "Zero perfcent!" My husband said. "What? How do you know?" I questioned him. My husband didn't even bother to follow up with an answer. After about one and half hours, our bus reached the US-Canadian border. We were asked to bring our luggage and line up in a room to go through the border control. "Who can speak French here?" One of the four U.S. border control officers shouted to us. Among the 30 or so passengers on our bus, only three raised their hands, including my husband. The officer waved his hand hand at my husband, gesturing him to come our of the line. The officer then checked my husband's passport and luggage and took him into one of the back rooms. After a long while, my husband emerged. I asked him what happened. Turns out, a French-speaking lady arrived at the border this morning from Boston going into Canada. She didn't have a Canadian visa for entry, so she had been detained. She didn't know that she needed a visa. The officers asked my husband to help translate by asking the lady whether or not she had a bus ticket to go back to Boston. Luckily, she did. We then figured out that the poor lady had been sitting in that office for almost 6 hours. My husband told me that when he began to speak to her in French, the lady started to cry. "Why didn't anyone speak French to her earlier?" I asked, thinking that perhaps there is some weird regulation forbidding officers to speak French even if they knew how. "The officers said their interpreter has been off duty," explained my husband. This meant that none of the officers on duty knew French. At this moment, I still couldn't wrap my head around the fact that none of the officers — placed on duty at a border with a nation that has many French speakers — were incapable of speaking a language used by many in the neighboring country. After getting off the bus in Burlington, we took a cab to our hotel. The ride was only a few minutes, but I had to ask the driver my burning questions. "Are you from Burlington?" I asked, unassuming him to be a local. "Yes, just a little north of it," he graciously replied. "What percent of residents of Burlington can speak French?" "Very little. Minimal... Yes, some can speak French. They are from Congo. But you know, Burlington is not Vermont," the driver explained. "You mean more people can speak French outside of Burlington or the other way around?" I knew what he meant. It is sort of like people saying New York City is not the United States. "The other way around," the driver said, pausing a bit, "You know, we have language immersion programs. Everyone has to learn English in school. That relieves our need to speak other languages." He said it as a matter of fact. I had no way to tell how he felt about it. In the Chinese language, there is a four-character idiom — 任重道远. 任 (rèn) means task; 重 (zhòng) means heavy; 道 (dào) means path, road or way; and 远(yuǎn) means far. This idiom means that when you have a laudable goal, it will be tough work to achieve it, but you will not give up until you are successful. Your long-term devotion to that goal is called "grit" — a behavior identified to account for success in all walks of life. The scientific discovery of the importance of "grit" is attributed to Dr. Angela Lee Duckworth, a Chinese-American psychologist from the University of Pennsylvania. In this fresh beginning of 2017, let's remember this line for ourselves, our children and our students.